Click here to see all 4 possible configurations of jar bar designs. The TOSS Application Engineer will gladly help you choose the type of materials to use under your heat seal band. The face of the opposing jaw must be soft enough to deform and compensate for any deviation or deformation in the alignment or flatness of the face of the Heatseal Jaw. In addition, the jaw facing must be covered with PTFE-SA Tape to assure a clean release of the film after sealing. The jaw facing must also be hard enough to present a firm face so that the jaw force is directed principally on the band and not on the adjacent surfaces of the soft face. For general applications a strip of self-adhesive, 30° durometer silicone rubber, 2 mm thick and 15 mm wide is satisfactory. 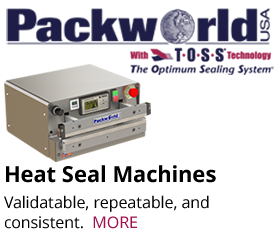 Durometers of up to 60° Shore Hardness or Durit are often used for cutting and work well, even on thin films. 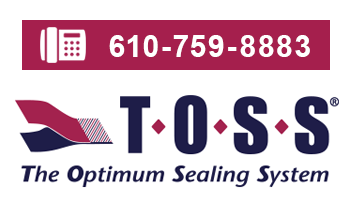 TOSS carries a large inventory of PTFE tapes. Rolls can be ordered in many widths and thicknesses. 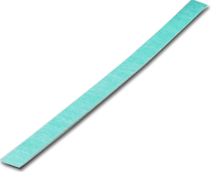 This PTFE Self Adhesive Tape is available in widths that match the jaw bar width. Its purpose is to come between the heat seal band and the layer of backing material. It is important to have PTFE materials on both sides of the heat seal band as during the heating cycle the band will grow and shrink and the non-friction surface of PTFE will help to keep the band from being damaged. 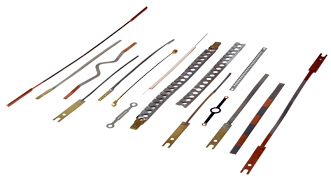 TOSS Alloy-20® Impulse Heatseal Bands are available in over 350 styles, shapes and sizes. Custom designed for any application, new or existing, TOSS Alloy-20 Impulse Heatseal Bands are longer lasting and provide for effective sealing at optimum speeds. TOSS’s Norex® Impulse Heatseal Bands are ideal for sealing applications that require a minimal amount of heat seal band expansion. All TOSS heat seal bands are mounted between a layer of PTFE tape and a layer of PTFE cover strip whenever the operating temperatures are below 250ºC. Polyimide tape and cover strip is used if over 250ºC. “PTFE Tape” is primarily used as a covering over Heatseal Bands to prevent the hot plastic material from sticking to the band as well as over the silicone elastomers on the opposing jaw. It is occasionally used as an electrical insulator between the Heatseal Band and the jaw when a minimum thermal insulation is desired. 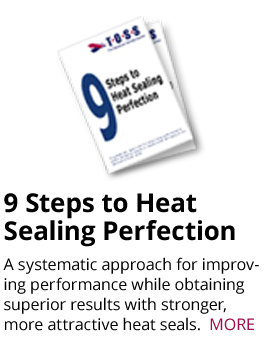 The proper selection of thickness and style is imperative if good consistent seals are to be obtained. Contact our Application Engineer to learn more and to design the perfect configuration for you. The upper temperature limit for safe operation with most all PTFE coatings is 250°C as with all PTFE products. Polyimide is the cover material of choice if sealing temperatures exceed 250ºC. Polyimide has a non-stick surface which should be mounted facing the sealed goods. This material, pronounced sig-la-ha, is named as a contraction for “silicone-glass-hard”. 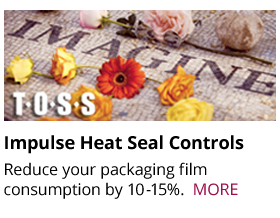 It is 1 mm thick and available with a self-adhesive backing in standard widths of 12 and 15 mm. Other widths are available on special order. This material is a very good electrical insulator and a reasonably good thermal conductor. It is durable and works well for temperatures up to 280°C. It is often preferred for backing beneath Beaded Bands, T-Profile Bands, and Cutting Wires because it provides maximum hardness and support to enhance cutting action. It is hard enough to be surface ground after being adhered to the face of the jaw should such precision be necessary. Also available with self-adhesive backing, 1 mm thick, both 12 and 15 mm widths are standard. This material is available in other widths as well. Durit® is less hard and more pliable than Siglaha. It has an operating temperature range of up to 400°C, it is a good insulator, and has lower thermal conductivity than Siglaha® or Cover Strip. It is durable and a good choice for machines operating with long heating cycles or constant heat or where cool-down rate is not critical. There are a number of configurations you may wish to use it setting up your jawbars. 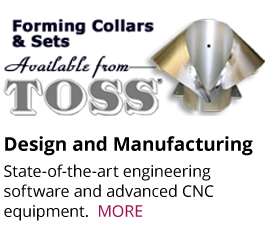 A TOSS Applications Engineer is available to help you design the perfect system. It is necessary to provide a back-up material behind the Heatseal Band when it is mounted on the Heatseal Jaw Bar or platen. 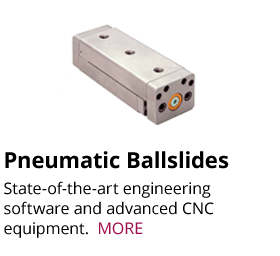 It is also necessary to provide a cushion or facing on the opposite jaw bar or platen face. The selection of the best combination of these components may require some testing to determine which combination of these elements is most effective with the goods to be processed. It is essential that the Heatseal Band be both electrically and thermally insulated from the jaw bar. 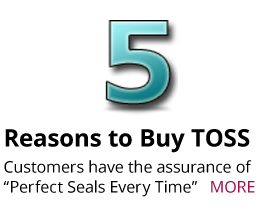 The most common materials used for this purpose are PTFE tape, Siglaha, Polyimide and Durit.